Lost in the shuffle of various comic conventions like San Diego and New York are smaller shows that warrant attention as well. One of those shows is NC ComiCon 2014 and this year's show will feature Valiant Entertainment bringing along their own special form of valiant in the form of The Valiant Chevrolet Equinox, featuring the artwork of Paolo Rivera. Fans attending the show November 15-16 can visit Valiant at Booth #A4/A5 inside the Durham Convention Center to discover why The Valiant – the all-new limited series epic from Jeff Lemire, Matt Kindt and Rivera – is one of the year's most anticipated new releases with a free copy of The Valiant: First Look. Get a behind-the-scenes look inside the battle ten millennia in the making right here with this free, exclusive preview edition packed with never-before-seen artwork, preview pages, and interviews – and featuring nearly every Valiant hero! Start reading here to find out why The Valiantis one of the year's most anticipated new releases. Plus, get an eyeful of Rivera's action-packed interior art from The Valiant #1 on the full body-wrapped The Valiant Chevrolet Equinox – stationed inside Durham Convention Center all weekend long. Aspiring creators will also have the chance for one-on-one portfolio reviews with Valiant Chief Creative Officer Dinesh Shamdasani on Saturday, November 15th. Stop by table #A73 in Hall A at 2 PM for personal feedback and creative insight from Valiant Entertainment's own Dinesh Shamdasani. 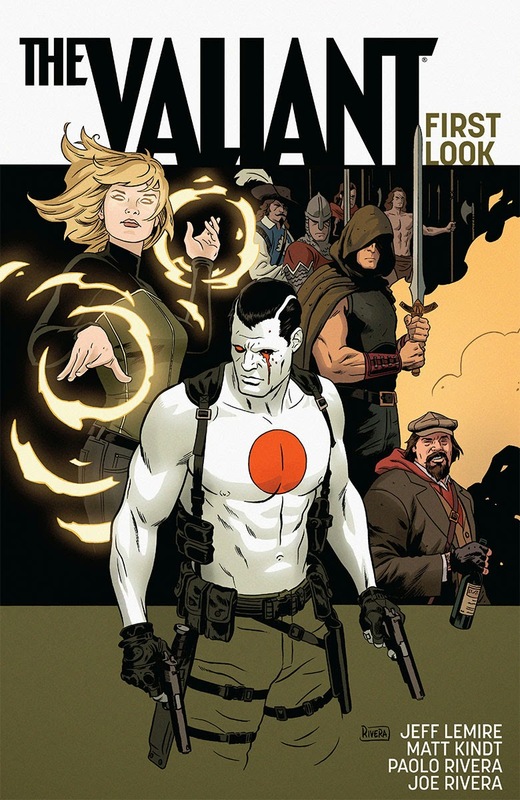 Beginning with The Valiant #1 (of 4) on December 10th, don't miss each exciting title from Valiant Next – an all-new wave of ongoing series and prestige format projects from some of the premier creative talents in comics today. 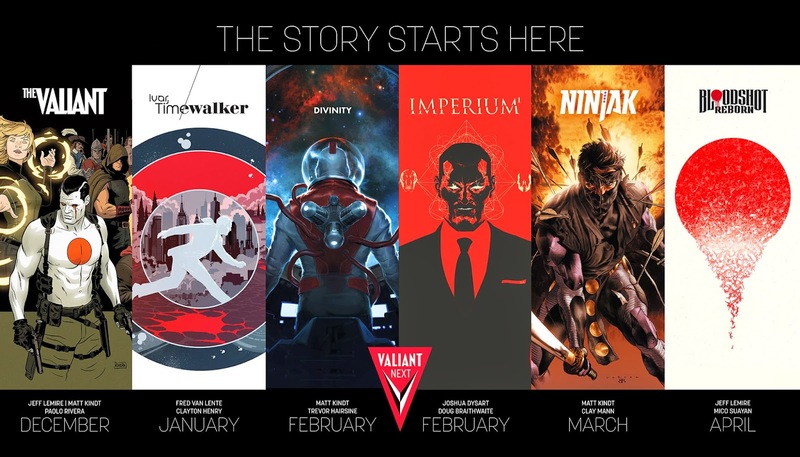 Beginning with The Valiant #1 in December, Valiant Next continues with five blockbuster new series in 2015. Featuring the Official THE VALIANT Chevrolet Equinox! Valiant Entertainment is joining NC ComiCon 2014 on Saturday, November 15th through Sunday, November 16th for a weekend packed with giveaways and special guests – plus a surprise appearance by THE VALIANT Chevrolet Equinox, featuring the stunning artwork of superstar artist Paolo Rivera! Visit Valiant at Booth #A4/A5 inside the Durham Convention Center to discover why THE VALIANT – the all-new limited series epic from New York Times best-selling creators Jeff Lemire, Matt Kindt, and Paolo Rivera – is one of the year's most anticipated new releases with a FREE copy of THE VALIANT: FIRST LOOK! Get a behind-the-scenes look inside the battle ten millennia in the making right here with this free, exclusive preview edition packed with never-before-seen artwork, preview pages, and interviews – and featuring nearly every Valiant hero! Start reading here to find out why THE VALIANT is one of the year's most anticipated new releases! Plus: get an eyeful of Eisner Award-winning artist Paolo Rivera's action-packed interior art from THE VALIANT #1 on the full body-wrapped THE VALIANT Chevrolet Equinox – stationed inside Durham Convention Center all weekend long! And that's not all! Aspiring creators will have the chance for one-on-one portfolio reviews with Valiant Chief Creative Officer Dinesh Shamdasani on Saturday, November 15th. Stop by table #A73 in Hall A at 2 pm for personal feedback and creative insight from Valiant Entertainment's own Dinesh Shamdasani. For tickets and directions, visit NCComiCon.com.